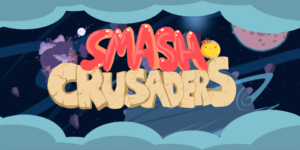 Smash Crusaders, a free and fun mobile game, is available for download on the Apple App Store and Google Play. The title, a Breakout-meets-endless-runner game, was created during the 2016 MassDiGI Summer Innovation Program (SIP) by students Sam Luangkhot from Smith College, J Tuason from RIT, Marc McCrevan from Becker College, Andrew Barrett from Northeastern University, Liam Doherty from Letterkenny Institute of Technology (Ireland) and Joe Marchuk from Berklee College of Music. Working over the summer, the SIP team produced a beta/near-release version of the game – watch the trailer here. From there, we brought the game into our LiveStudio program at Becker during the fall ’16 semester. Through LiveStudio, more students across a range of disciplines had roles in polishing the game, originally known as Slime Break, and getting it ready to launch. For a roster of all the contributors to the game check out the credit roll. You can download Smash Crusaders today for iOS and Android.